This groundbreaking natural colour restorer is perfect for every hair type, any ethnicity and gender. How you apply the HAIRPRINT Colour Restorer treatment will depend on the condition of your hair, the amount of grey and whether it is resistant or not. Different application methods are available to suit your hair type, current condition and desired amount of grey coverage. The standard and previously chemically treated methods are essentially the same. For resistant grey hair we recommend starting with the standard application, then gauging if you would want better coverage. The amount of grey coverage you desire will determine how many the steps are applied and which method you use. Which application is for me? The standard application of this groundbreaking natural colour treatment is very straightforward. Do your homework to understand the products you use in your current hair care regime to prepare the hair and scalp for the journey. If the hair is residue-free with nothing blocking the treatment, HAIRPRINT will work. Guaranteed! The standard application for hair that is virginal i.e. 100% chemical free, is the best place to start and gauge how your hair responds. Ensure you have chosen the right colour. From there you can try different application methods if need be. If you need advice get in touch! 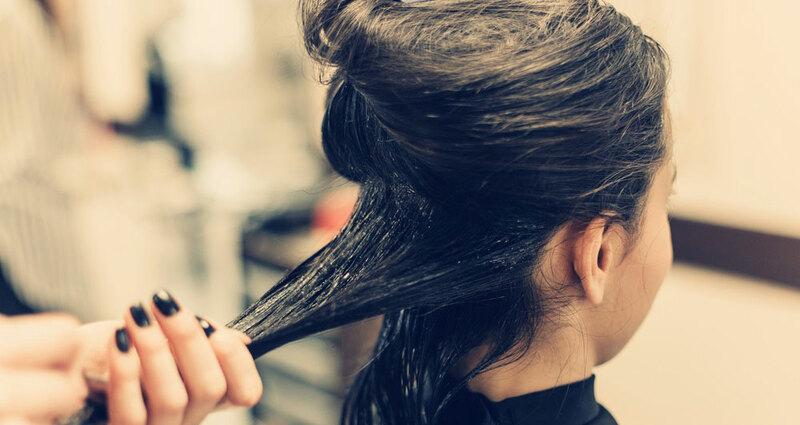 If your hair has currently undergone a chemical treatment, i.e., it has been permed, relaxed, dyed, highlighted or bleached, go through the Transition application process. Protecting hair that has been compromised by chemical treatment might be necessary. For information follow the link – What is causing the damage? We advise the standard application on regrowth while protecting ends that might need it; possibly splitting a kit. Ensure you understand removing blockers and residue-free hair before beginning your journey to hair that is full of vitality. When hair is resistant, it could be trying to tell you its time to accept some of your greys. The beauty of Hairprint Colour Restorer is you can take some of the greys away, thereby still looking your age but not being 100% grey. If you would like to achieve a ” just going grey” result, try the standard application first. If you have grey coverage of more than 50% and would like would like a total coverage, a resistant application may be necessary. Check here to see if you might need two kits. How many kits do I need? Please consult our post on Hair Residue and Blockers before using the HAIRPRINT Colour Restorer for best results. Follow the application methods for step by step instructions. Ageing causes the porosity of our hair to change and is the main contributor to the hair not accepting pigments or in this case eumelanin. For some, it might be a problem, for others not. Hairprint is not for those whose hair is completely grey/white. Please consult our post on Hair Residue, and Blockers before using HAIRPRINT. HAIRPRINT is a three-step colour restoring process, so if your hair is still grey after Step 1, don’t panic! Once all application stages are completed entirely, your hair will show full results. Continue to Step 2 (Restore again) and Step 3 (Complete). If you remain uncertain on how to apply, please ease your mind reading through the best application methods. Continue to Step 2 (Restore again) and Step 3 (Complete). If you remain uncertain on how to apply, please ease your mind by reading through the best application method for your hair type and be sure if you will need 1 or 2 kits. If you need assistance in deciding on the number of kits to apply, read our write up on using 1 or 2 kits. Your hair will still be grey after Step 2 because HAIRPRINT is a three-step process. Your hair will not show complete results until after the final step is complete. It is the last step of Restore that gives you the final result. Please continue to Step 3. If you have any questions on the application process, please visit our How to Apply page to review the instructions. If your hair is still not covered as you might have wished, please troubleshoot why. If you remain uncertain, we have plenty information available on the application process. Should I Dry My Hair With A Blow Dryer During The Application? We do not suggest the use of a hair dryer until the entire treatment is complete, and you have conditioned your hair. Follow the application instructions suited for your hair type and condition. Powder Colour The three powder sachets included in the HAIRPRINT Colour Restorer kit may be white, ash brown or brown when opening. The colour of the contents does not determine the outcome of the treatment or the efficacy of the treatment. What to expect when mixing colour – the mixtures will swell and change colour from salmon through to a dark red. At that point, you begin to apply. As the mixture oxidises with the air, it will go very dark and look black. Your hair will not be this dark. Restore powder and liquid, expand into a mousse. Complete powder and liquid do not expand as much and stays like a gel and produces a gentle heat. The heat opens the hair making it more receptive to the final step. Mixture Stood For More Than 6 Minutes. Can I Still Use It? Unfortunately, you cannot use the mixture after it is left standing untouched for more than six minutes. Each step must be applied within 5 – 6 minutes of mixing, or it becomes less active after this time. What If I Leave A Step On Shorter Or Longer Than 15 Min? Leaving the HAIRPRINT treatment on for less than 15 minutes will not produce optimal results. Extending the processing time to 20-30 time will only make a difference with facial hair. If you have confused the Restore sachets with Complete sachets in any way, discontinue treatment and start again. We are here to help if you need to ask any questions.